CarGurus has 78,913 nationwide Accord listings starting at $1,121. The 2011 Honda Accord offers impressive refinement and tech without an excessive price. Lame entry-level engines, elitist options and dated styling make the 2011 Honda Accord a less attractive entry than it once was. Honda's Accord has been chasing the Camry for a while now, and this mid-cycle refresh doesn’t look like it has the chops to change anything. Instead of focusing on giving us barely changed bumpers and “new” wheel designs, perhaps Honda should consider treating features like Bluetooth and a navigation system as something other than ultra-luxury options. The lack of USB connectivity across the line-up says it all – the Accord is still stuck in the 20th century in a lot of ways. The 2011 Honda Accord hits its mid-cycle refresh this year, although the changes would be easy to miss. Maybe Honda has gotten lazy with its perpetually leading sales figures, or maybe it just doesn’t feel much of an update is necessary for its midsize maven. Regardless, look to a revised bumper and grille on the four-door sedan, as well as small trunk-lid changes and new 17-inch wheel designs. Despite rumors of a new six-speed automatic transmission, we’ll have to settle for a re-geared five-speed that will improve fuel economy. The interior controls have been tweaked slightly, but you’ll barely notice, and USB ports have been added to swankier trim levels. Upgrades perhaps, but Honda should be thinking about doing more if it wants to keep its venerated place in the automobile hierarchy. Accords get motivated by a 2.4-liter inline four or a 3.5-liter V6 engine. 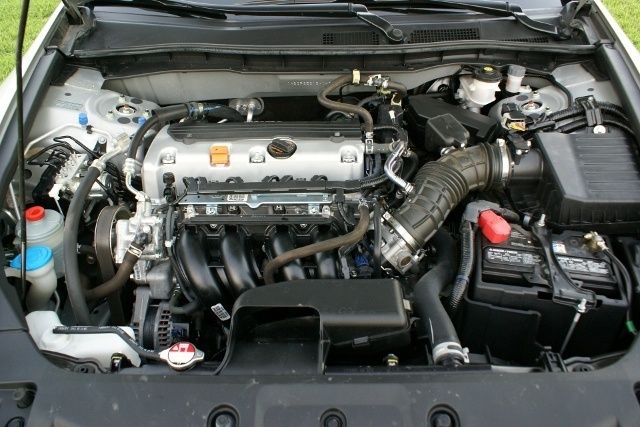 The 2.4-liter comes in 177- and 190-hp varieties. Either one is competent from the line, but both lag when called upon at higher rpm, despite camshaft changes for the big brother. The 190-hp version that comes in the EX and EX-L trims is a bit more potent, especially at speed, but you’d still benefit from moving up to the optional 271-hp, 3.5-liter V6. It’s strong and smooth and much more refined than its two lesser counterparts. It's a shame that even Honda refuses to offer a more sophisticated entry-level engine. Here the V6 is offered only with the five-speed automatic, with the five-speed manual being reserved for the four-cylinder powerplants. Quite sad, as both are smooth and precise, and the option of a manual transmission for the V6 would add a jolt of sportiness the Accord lacks. Faster than the automatic, the manual just changes the feel of the car, even adding enjoyment to the rough four-cylinder engines. With adjustments made to the automatic transmission, either four-cylinder engine will offer 23/34 mpg, or 22/31 with the manual. The V6 is little worse, still managing 19/30 despite 100 extra ponies over its littlest sibling, and all on regular-grade gasoline, too. Never nimble, the Accord is nonetheless a sprightly midsize, landing on the sportier side of its collective competitors. With an expected blend of road-holding and comfort, the Accord manages to combat roll and lean without becoming overly harsh, even managing to inspire a bit of excess speed in turns. Steering is a bit lighter than one would want, but it still manages to avoid the vagueness often found in the midsize category. Watch out for large bumps and tears in the road, however, as these will very suddenly take the Accord from composed to flustered as the jolt transfers violently through suspension and chassis. Harsh vibration from either four-cylinder will also transfer through the steering wheel, transmission and body in both idle and hard acceleration instances. Unacceptable. Oh Honda, why do you toy with us? You do so many things so well, and then fall short in critical places. The ergonomics, both visual and physical, are welcome and accessible in the Accord. Often-used climate controls have been placed in easier reach, while the overall design of the gauges and controls remains the same, with large dials and readouts providing information at a quick glance. Digital readouts have been designed to be read regardless of light conditions, angle or eyewear, and this is one of those invisible technologies you’d only notice if it were missing. Still, we have to question the continued use of bland plastics and sequestering useful features like USB connections and navigation systems to the higher-level trims. Most competitors are making features like these standard, while Honda expects you to shell out $2,200 to shoehorn a nav system into their top-tier trim, the EX-L, the only trim that offers it. Similar issues are found with Bluetooth and heated leather front seats, also EX-L-only features. Wood-grain accents are also available solely in EX and EX-L trims, a feature that does a lot to dress up the interior. Noise is a large issue, too. Road noise permeates regardless of trim, and does so in a manner excessive for the class. Both four-cylinder engines will also provide a cacophony of violence in the form of noise, ruining the enjoyment of almost any driving situation. Safety is no mixed bag, however. Rather than sequester important options and features to only top trim levels, all Accords are blessed with traction and stability control, four-wheel antilock discs, daytime running lights and six standard airbags. Thanks to this, the Accord was the National Highway Traffic Safety Administration's top pick for 2011 under its new, more rigorous standards, earning 5 stars in all three of the NHTSA's tests - the only vehicle to do so. Despite almost universal complaints from testers about the four-cylinder engines, owners still gravitate toward the smaller powerplants, which account for 80% of Accord sales. The overall fit and finish of the Accord has always been a strong selling point, but some owners have complained that it’s starting to look dated. Only offering features like nav, Bluetooth and USB in the upper trims is also a point of contention, especially when competitors are making them standard features. Finally, noise from the road and the smaller engines is simply out of place here, ruining an otherwise enjoyable experience. 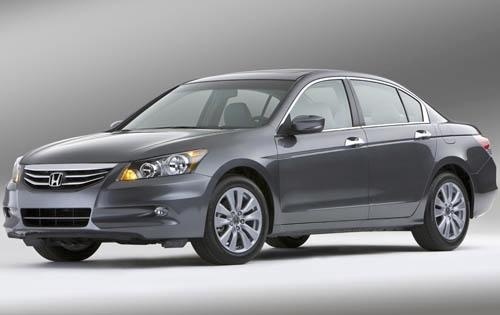 What's your take on the 2011 Honda Accord? euphoric77 I don't have the money to spend on premium brands, and thus i must evaluate these machines from a purely utilitarian perspective. From that perspective, this has been a good purchase. Effotless consistency, cheap maintenance, acceptable handling, and creature comforts like air conditioning and stereo speakers that meet my fairly low threshold of satisfaction. The car was inexpensive, and depreciates slowly. So I'm never going to get a job as an automotive journalist. Ho-hum. Users ranked 2011 Honda Accord against other cars which they drove/owned. Each ranking was based on 9 categories. Here is the summary of top rankings. Have you driven a 2011 Honda Accord? My radio and clock screen went blank after I detached battery cables. 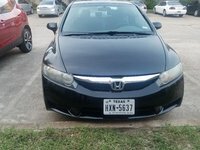 Imy vehicle is a 2011 honda accord ex 4 cyl. I resolved the issue by replacing Under hood fuse 15 labeled backup. 10 amp. 2011 Honda accord SE won’t turn over. Has battery power.